Your relationship with your doctor is one of the most important in your life. You and your provider have to be able to work together to achieve the best results for your health. Still, there are ways to humanize the assembly line and get the support you need. Right from the start, focus on how you and your provider can work together most efficiently. 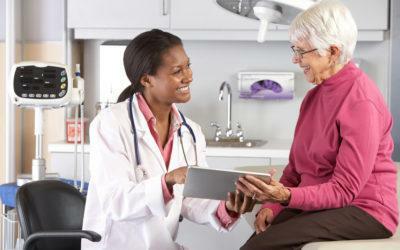 Here are seven tips for a successful doctor visit. Schedules are busy. Diabetes care guidelines are complex. The American Diabetes Association (ADA) standards of care say that doctors should monitor glucose, blood pressure, weight, cholesterol, heart health, kidneys, eyes, and feet. Under this pressure, doctors may start to see you as a collection of lab tests and symptoms, instead of a person. Greet the doctor and the staff and ask how they’re doing. If they have pictures of family on the wall, or awards or sports team banners, you could say something about them. Perhaps reveal something about yourself, like your work or a passion for something, especially if it’s relevant to your diabetes. Make it brief, though. They don’t have time for idle chat. 2. Learn how your doctors communicate. How does your doctor keep in touch? She may be too busy to talk on the phone, but does she have e-mail? E-mail, sometimes provided via “patient portals,” is great for less-urgent questions, but sometimes you need a quicker response. If there’s someone else who handles urgent matters like sick days or mental changes, you need a relationship with that person, whether a nurse, a medical assistant, or someone else. Ask to meet him or her. You probably have several doctors and maybe more than one pharmacy. They all need to communicate. It’s up to you to make sure all your providers know about each other. 3. Collaborate in your care. How active a participant do you want to be? Will you be happy following orders, or do you want to research and try other approaches? You and your doctor should be on the same page about collaboration. If you find out about a supplement or a low-carb diet that looks good to you, you should be able to run it by your doctor. E-mail is good for this — include links or copy in articles or websites about the new approach. Some doctors will respond favorably to new information, which might, after all, help other patients. Other doctors will reject almost anything they haven’t learned about and may dismiss information you send them. You want a doctor whose attitude matches yours. You may want to work with your doctor’s office on treatment goals. Can you agree on a target A1C to shoot for? How tight do you want your control to be, and does the doctor want the same thing? You may have other goals, such as improved fitness, reducing meds, going back to school, or any life goal. Typical medical doctors now have about 2,500 patients in their care. They can’t remember the details of your case; you have to remind them. Most people do not keep such detailed records, but do what you can. Do you have glucose logs or blood pressure logs you can share, either written or from your meter? Are there any big changes in your life that affect your self-care? Have you been taking your meds as ordered, and have there been side effects? Let your doctor know. Come to appointments with two or three questions you want answered. Have them written down and bring them up early in the appointment. Be ready to write down or record the answers. If that’s too hard, can you bring someone else with you to record and remember things? You and your doctor share a common interest in getting the best results with the least time and effort. Being straight with him or her helps accomplish that. Speak up about how your financial situation may impact your care. If you can’t afford the drug or equipment he prescribes, maybe he can change the plan or help you get assistance. 7. Try to stay relaxed with your professionals. Diabetes blogger Scott Coulter says, “We shouldn’t look at doctors’ appointments as ‘tests’ of how good people we are or how competent at taking care of our bodies. That anxiety can lead to more stressed, less productive interaction.” Doctors aren’t judging us. If they do, that’s not our problem. See more tips for successful medical appointments here. You have to work together with your medical professionals to help them help you. A good relationship with them will improve your care — may save your life.